Just opened a new package of colored chalk so I'll write on my blackboard :-). 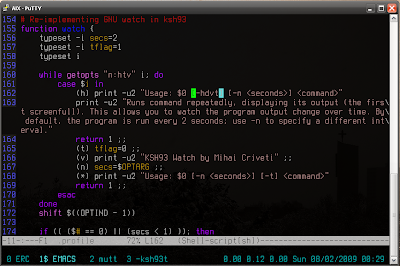 Terminus font (sure, it's not a tool, but it sure as hell helps , especially during those 20 hour debugging sessions). All you really need to do to get this working on AIX is to add a new TERMINFO entry (tic). 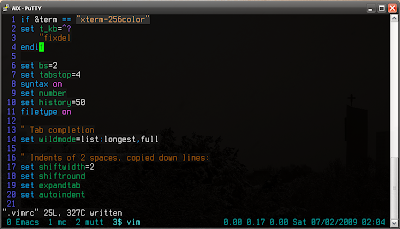 You can easily grab the 256 color xterm with infocmp..
My termcap does not have entries for xterm-256, xterm-256color, or screen-256color. Not quite sure how to install these (or make them with infocmp and tic). You can grab one from any system that has it with infocmp, and install the result with tic. 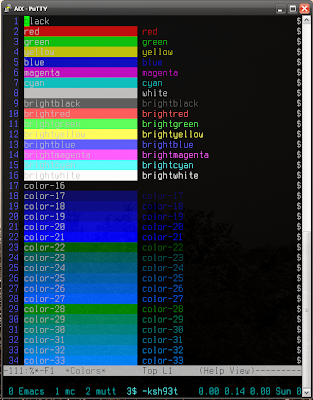 export TERM=xterm-256colors; infocmp > xterm-256colors.tic on any machine that has such a term. 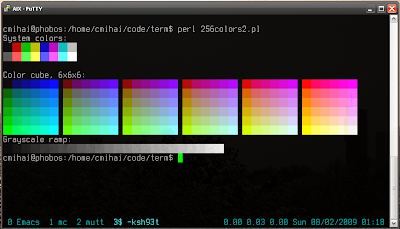 "tput colors" will output 256. I don't remember where I took mine from, I just kept a copy. You should be able to save this to disk as xterm-256colors.tic and import it into the terminfo database using tic. Thanks so much for this! I had mistakenly copied my pre-compiled terminfo entries from my mac to my linux server and wondered why it wasn't working correctly! using infocmp to export the info and then tic to compile it is much better!